I showed you a preview of this design last week, and here it is in more detail: my Snowflake cushion. 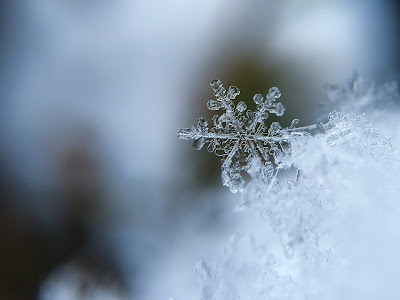 I have always been fascinated by snowflakes, with their perfect six-fold symmetry, and each one being unique. In keeping with this, the snowflake on this cushion cover has six long arms, which was something of a challenge, as the shape of knitted stitches is better suited to shapes with two- and four-fold symmetry, but I'm pleased with how the design turned out. Snowflakes have six-fold symmetry. Image from Splash on Pixabay, used under Creative Commons CC0. The Snowflake cushion is knitted using the intarsia technique, as it features long stretches of the stitches in the same colour, but if you wanted to save yourself a few ends you could strand the regions where the colour changes are frequent (in general, I'd work sections with colour changes up to every 3-4 stitches using stranded colourwork). I would strongly advise using yarn bobbins for this design - in some rows I required 18 bobbins - otherwise you'll get in a tangle. Remember to keep the bobbins close to your work, only unwinding yarn as you need it. But intarsia is not a complex technique if you take it slowly. The cushion cover is knitted in Drops Alaska, a rustic, aran weight 100% wool yarn that is very good value (and Drops often have 25% discount deals, which are worth looking out for), and perfect for intarsia as the yarn is quite grippy, making for neat colour changes and ends that stay put when they are darned in. The Snowflake cushion could also be knitted in any plied wool or wool/acrylic blend yarn, such as Stylecraft Life Aran, which is one of my favourite yarns for homewares. The cushion cover is knitted in an envelope style, fastened with four 4cm wooden buttons. If you wish to make your own Snowflake cushion, the pattern can be purchased via Ravelry or Love Knitting.